One fateful day about 3 years ago, I was playing on my favorite website, Pinterest, and I came across a pin that said something like “How I made 2 trillion dollars with my blog.” Naturally, I was intrigued. I clicked through and read an article that blew my mind. This blogger was making money, lots of money, from writing about being a mom and saving money. I had no idea that money could be made from a blog or that anyone could just pop one up on the interwebs and call themselves a blogger. Mind blown. I started clicking on blogging pin after blogging pin, I was probably like two hours deep when I found a “start a blog in 20 minutes” post. Jackpot. 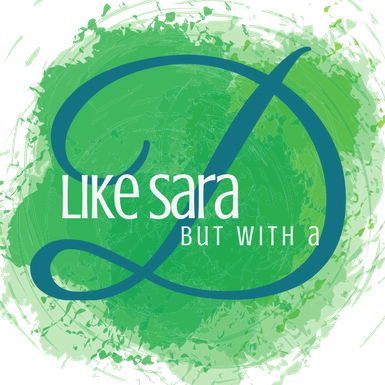 I followed those instructions step-by-step, and like sara but with a d was born. Unfortunately for me, one of those steps was to sign up for hosting with, you guessed it, Bluehost. I mentioned them a while back when I was discussing my blogging toolkit, and at that time I was perfectly content with the hosting choice. I got the occasional email from the Jetpack app that my site went down for a minute or two, but I figured that just happened sometimes. Then last summer I started to get a lot of those emails, like every day and sometimes even multiple times per day. Not only were they coming all the time, the down times were increasing as well. It went from 2 minutes at a pop to over half an hour! I got a little irritated. I mean I’m paying them, and it isn’t like they are refunding me for all that downtime! So, when it was time to renew my hosting, I ditched Bluehost and switched to SiteGround. You guys, I was seriously scared that it would so hard to switch my site over or that everything would just be gone, but it was sooooo easy! Seriously. Siteground does pretty much everything for you, and they walk you through the tiny bit you have to do yourself. Easy Peasy. Best part? My site hasn’t been down one single minute since making the switch. Jetpack hasn’t made a peep. Who do you use for your web hosting? Things that make you go hmm. I am with blue host because usually I dont even think about it. 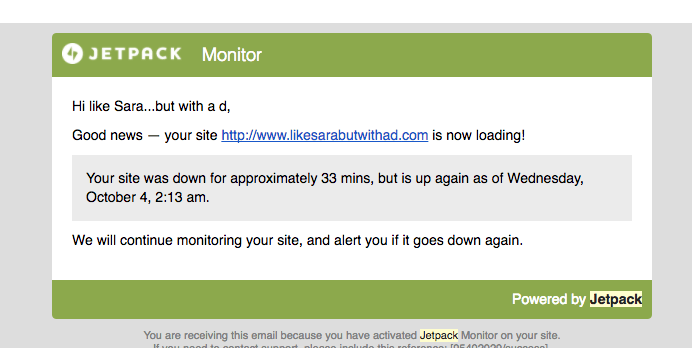 That is until last week when Jetpack lost its marbles and sent me like 15 emails about my site being down. Though I couldnt read them cause my email is through bluehost and it was down too. Then I IMed their customer service and they said it was fine on their end. I asked where their server farm was and were was mine. Theirs, India…mine…Kentucky. Ugh. I may have to really think about the switch. How is the cost comparison? The initial cost was pretty cheap with Siteground…but so was Bluehost originally. Hold off for a minute though, because I have heard through the grapevine that Siteground may try and stick users with extra fees. I’m at BlueHost now, and haven’t had an trouble. But I’m still learning more about other companies too just to be able to make an informed choice when it’s time for renewal! I think everyone starts with Bluehost! It is basically what every “Start a blog…” recommends. Currently, I am not hosted. I needed to get my feet wet without spending any money. However, I have found my passion and want to do it right! I was in a group that ONLY used Bluehost! But I’m seeing more and more about how great SiteGround is. Thank you for your honesty and not just trying to make a buck or two! This just maybe my final decision! Aaaah! Too much pressure 🙂 I haven’t been with Siteground quite long enough to say with 100% for sureness that you should choose them. Give me a few months! Thank you for this. I’m with Go Daddy. (Yikes…I know) but I’ve been scared to switch. Although I haven’t has any problems with them yet I know that as my blog grows they won’t be able to give me the service I’ll need. I don’t know much about Go Daddy. It is hard to know which is best! Is there an advantage to being hosted? I currently have a WordPress blog, but it’s not hosted as far as I know.